Ali Zaoua, Omar, Boubker, and Kouka, four homeless boys living in Casablanca, break away from their gang of young criminals lead by a man named Dib. Led by Ali Zaoua, the four boys commit small crimes in order to survive on the streets. Ali decides that he is going to become a cabin boy on a ship in order to begin a better life. However, Ali is killed by Dib’s gang before he is able to leave. Omar, Boubker, and Kouka pledge to give their friend a burial fit for royalty and hide Ali’s body from Dib and his young criminals. The three boys find meaning and peace as they jointly search for a means to give their good friend a proper burial. 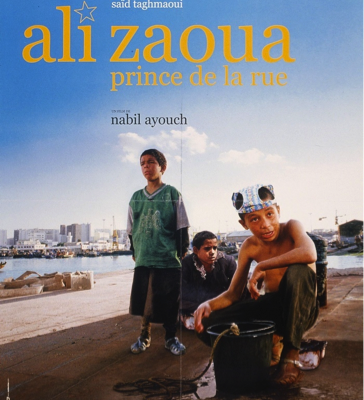 Sufi Mysticism and Dreams in Nabil Ayouch’s Ali Zaoua, Prince of the Streets by Christa Jones. Jeunesse: Young People, Texts, Cultures, Vol. 5, No. 2 (Winter 2013), pp. 80-95. Ali Zaoua, Prince of the Streets: The Harsh Life of Street Children and the Poetics of Childhood by Josef Gugler. Film in the Middle East and North Africa: Creative Dissidence (2011), pp. 339-348. African Films in the Classroom by Josef Gugler. African Studies Review, Vol. 53, No. 3 (December 2010), pp. 1-17.